SOLD Magna Britannia complectens Angliae, Scotia, et Hibernia. Size: 22.5 x 19 inches. 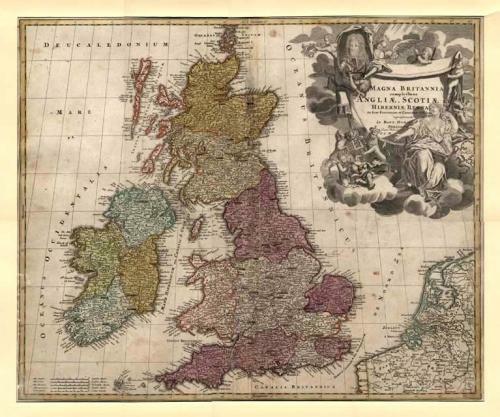 Large map of the British Isles by Johannes Baptiste Homann, one of Europes premier mapmakers of the 18th century. The map has a spectacular large format cartouche that includes a coat of arms and portait of King George, an allegorical representation of Britain, the unicorn and lion and other figures. The map is very presentable although it has had some restoration to the border in the lower left corner and also to the margins that have been professionally replaced.